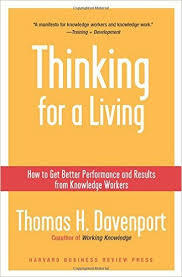 Thomas Davenport is also the co-author of Working Knowledge: How Organizations Manage what they Know (with Larry Prusak). Working Knowledge came first, in 1998. Thinking for a Living followed in 2005. Ten years later, in 2015, in an article titled "What happened to KM? ", Davenport suggested that KM wasn't dead but it was "gasping for air." Every year, someone asks whether KM is dead or not. I don't think this is unique to Knowledge Management. I just saw "Is Instructional Design Dead or Alive?" Is it asking whether it was just a fad? The question irritates me. I get the feeling that it's a call to jump on the next bandwagon. KM is dead. Forget about it, let's get into Big Data, Cognitive Computing and Artificial Intelligence.. that's where the action is. Perhaps that's where the money is too? I think I'll pass. I think I'll go backwards, back to organizational learning. Another question that irritates me to no end is "what is knowledge management?" which is typically followed by "what is knowledge anyway?" There is no better way of going absolutely nowhere with a conversation than to try to address these questions. The fact that they are continuously being asked may suggest that we're in a serious rut as professionals in this field. I find it depressing that the field is often perceived as either dying or spinning in circles. The answer to "is it dead or alive?" is "it's evolving." KM has moved into so many different directions that it is no longer unified in any shape or form that makes it recognizable as a professional field. The focal point is the knowledge worker. It's not just lip service to the "People" component of the people-process-technology triad. Knowledge Management may have started with discussions of the knowledge economy and split early on from organizational learning, getting confused with knowledge management tools/solutions/platforms, etc... but it's worth going back to the knowledge worker, the individual who is faced with knowledge challenges on a daily basis (and I'm not talking about email overload and disorganized shared drive). It's perhaps easy for us working in this field and calling ourselves Knowledge Managers or Knowledge Management experts to think primarily in terms of KM strategies, activities, etc... and become somewhat removed from the actual knowledge workers. We don't want KM to be part of HR, where it might be better integrated with Professional Development, Learning & Development, and Training departments where the focus might be on individual competencies and individual knowledge. We don't want KM to be part of IT where it might turn into an overly technology-focused solution in the form of tools, platforms, etc... with a perfect search engine and taxonomy to make it work. When KM is part of strategic management, it might turn into policies, processes and a whole lot of top-down directed activities. Regardless of the positioning of KM within the organization --which is another perennial question -- how can we ensure that the individual knowledge worker isn't lost in the shuffle. My answer is, by integrated individual, team and organizational learning. Make a note of questions being asked, the nature of questions, whether they are the right questions, etc... Revisit the art of questioning and the value of questions in reflective practice. Integrate key insights from Thinking for a Living in presentation/training materials for the role of individual knowledge workers in organizational learning. Develop an FAQ for KM-related terms and issues to insert as needed in presentation and training materials. Always have key definitions ready when presenting.